Ron Howard: Controversy helps new film, "Angels and Demons"
(CNN) -- "The Da Vinci Code," a film based on a novel from Dan Brown, opened three years ago amid controversy and protests. Now, a new film based on another Brown novel, "Angels and Demons," opened on Friday. 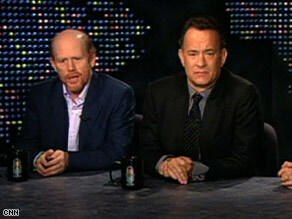 Ron Howard and Tom Hanks spoke with Larry King on Friday about their new film, "Angels and Demons." Larry King talked with the star of the movie, Tom Hanks, and its director, Ron Howard, about whether the new film will spark more controversy. Larry King: Ron, you held the world premiere in Rome, where the church is kind of sensitive about this. Why there? King: Tom, you have kind of put your stamp on this: "Angels and Demons," "Da Vinci Code." What attracted you to the project? Tom Hanks: Well, the intelligence and, I think, in some ways, the ambivalence of the character of Robert Langdon. He's a very smart guy. He's probably the only symbologist in the world, and his reading of the symbols, the history, is pushed through this sieve of knowledge that takes emotion and faith possibly out of any of the equations. He can look at something that would mean one thing to one culture, and it means something completely different in modern times or depending on what other culture it is. So as a selfish actor, it's great fun to play somebody as smart as Robert Langer. 'Angels & Demons' actors: What controversy? King: Was it a tough script to remember? Hanks: Well, you get into some pretty fascinating rigmarole. But, as we can all attest, we all end up having sort of like a seminar on all of these topics. We sit around for hours and discuss things like particle physics and what's it mean and the history of the Illuminati and who was and who was not a member of it. King: Ron, does controversy -- and this film has it -- help or hurt? Howard: I think it helps. In fact, it's part of what's interesting about what Dan Brown writes is, you know, it's thought-provoking stuff. Now, in "Da Vinci Code," really, the controversial ideas were driving the movie more than the action, more than the suspense. It really was about presenting those ideas and making the argument for them and stirring that thought. This has its ideas, and it is smart and intelligent and interesting. But I would say that it's reversed. I think that the mystery, the code breaking, the thriller nature of it is, from a directorial standpoint, really out in front. Still, you know, it has its ideas. They are controversial. At least it gives people something to talk about and think about on the way home if they want to. King: Tom, as I understand it, "Angels and Demons" was written before "Da Vinci Code," right? Hanks: Yes. It was written so long ago, in fact, that there was no Internet, there was no Google. Dan Brown, for some reason, presented the election of the pope as a minor story that is not really covered by the world's media. So it had some innate, I wouldn't say inaccuracies, but things that were taken out of time. It required a substantial amount of adaptation to the way life works in 2009. King:: Ron, does it bug you when many people in the Vatican, in the church, complain about the movie without having seen it or just basing it on they don't like Dan Brown? Howard: Well, you said it, Larry. I'm fully prepared to accept any criticism based on the movie. But, you know, it's absolutely frustrating if they're making an assumption. The idea here is to take any work of fiction, to build a thriller around a time when the church is in conclave. It's a heightened moment, and we all know that, at various times, the church, as any major institution experiences, has been compromised. And so some of the virtues are threatened by the personal agendas of those within it, and that's very human. In fact, you can read all about it in the Vatican bookstore. They'll tell you in history, you know, all about the number of times that that kind of thing has happened. So, Dan took inspiration from that kind of a circumstance and, I think, created a really interesting, exciting movie.